I tend to WAY overthink window treatments. It’s probably that the affordable boxed options are so limited. They are nearly all 84″ long and unlined or lightly lined. That’s not a lot of options. I lucked out when I found curtains for our family and breakfast rooms that I loved. When I search for curtains, it takes many, many hours and often goes on for months. Basically, I know what I want and it doesn’t exist anywhere. 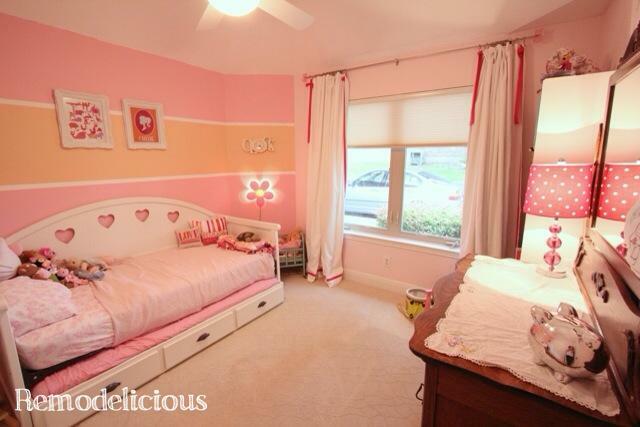 Chloe’s room was once yellow with green and blue curtains, but when we painted her room pink & orange, we didn’t put the curtains back up since she had white blinds for privacy. I fell in love with a pair of Pottery Barn Teen curtains, but at $99/panel, that option wasn’t for us. They would need to be hemmed 2 inches to be the right length, and I especially didn’t want to spend $200 plus shipping on curtains that I needed to work on. I set about finding a pair of plain white blackout curtains to embellish and found these on Amazon.com. The length was okay, but they weren’t wide enough for her super-wide window. After getting frustrated with my options, I set about making them from scratch. 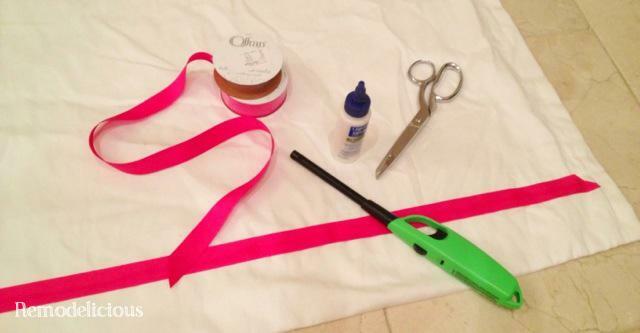 I bought white denim and blackout lining, miles of pink ribbon, and fabric glue. 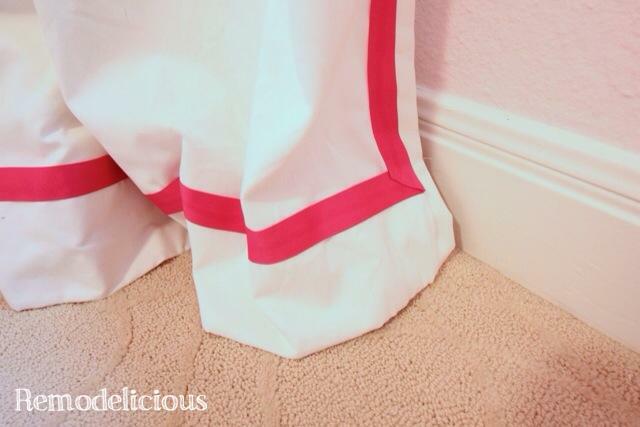 I mostly followed this tutorial (which I highly recommend) – the main variation was that I made double-wide curtains so I first had to cut and sew two sections together twice (one for each curtain). It turns out that making curtains from scratch isn’t for me. It’s not that it’s particularly difficult, I just couldn’t get into it so I put it off which made it take FOREVER. For a while, she had one curtain because I just couldn’t get myself motivated to finish the second one. That said, it was worth taking the time and effort because they turned out beautiful! 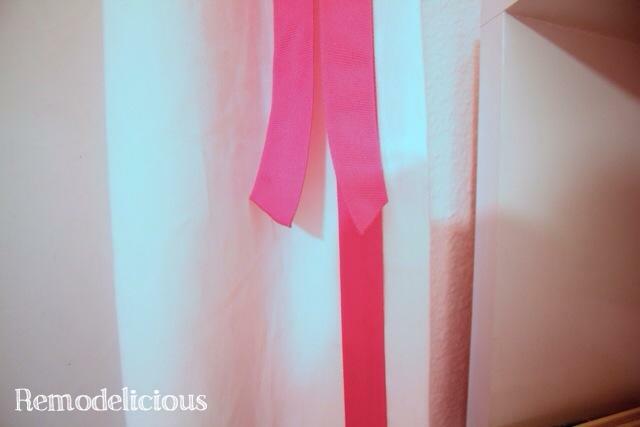 After making the white curtains, I glued the pink ribbon around the seams. I mitered the corners of the ribbon by cutting the ends at an angle, melting the edges with a lighter to keep them from fraying, and placing them together. 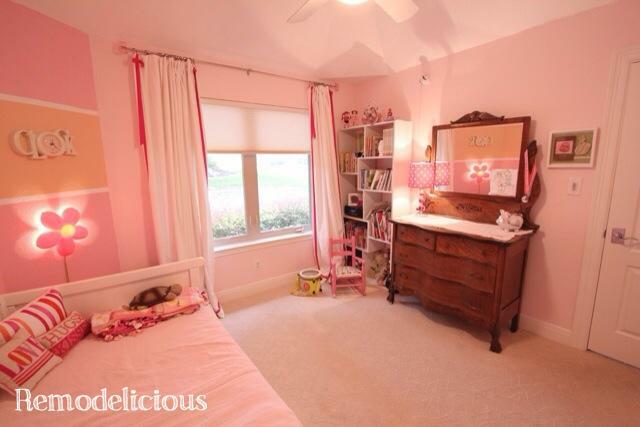 I love the pop of brighter pink (and so does Chloe). 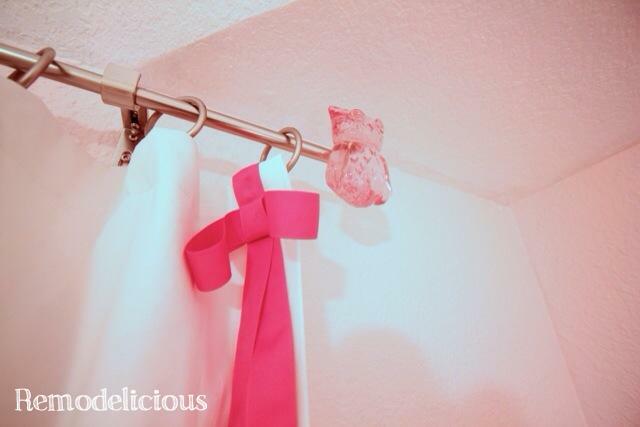 Since she’s so into dance and ballet in particular, I added a bow at the top of each side of each curtain. They are also glued. The owl finals were on sale at Pottery Barn in the spring. I bought the holdbacks because they were cheaper than rods and put the holdback finals on a rod that I already had. I also cut the ends of the bows at an angle and melted them to keep them from fraying. I love the length and how the graze the floor. The white mirror the white closet doors on the opposite side of the room, and it’s now easier for her to fall asleep when it’s still a bit light in the evenings. We still have a lot of curtains to figure out and I may end up sewing some more. The main problem with sewing curtains is finding a place to lay them out flat to measure, cut, and iron hems. When doing extra long, extra wide curtains, that can be a serious challenge. Since these turned out so great, I’m encouraged that I may be able to do another set down the road with the expectation that I need extra motivation – like admiring Chloe’s beautiful curtains!